This summer, medieval splendor will return to what is referred to by art historians as the “Sistine Chapel of Pisa,” and will be on display for many years to come. North of Piazza dei Miracoli and the Cathedral, Baptistery and Bell Tower, Pisa’s Monumental Cemetery (known as the “Camposanto” or “Holy Field”) was begun in 1278 by the architect Giovanni di Simone, and built over sacred earth brought from the Hill of Golgotha in Jerusalem during the crusades. Over the centuries it became the center of an outstanding collection of sculpture and paintings, including several famous fresco cycles by some of the greatest masters of 14th and 15th century Italian art. The earliest mural, the Crucifixion, was painted by Francesco Traini on the south wall in 1360, while other walls were frescoed with murals by Buonamico Buffalmacco, Benozzo Gozzoli, Andrea Bonaiuti, Antonio Veneziano, Spinello Aretino, Taddeo Gaddi and Piero di Puccio. An array of classical statuary and sarcophagi adorned both the cloister and the interior rooms. 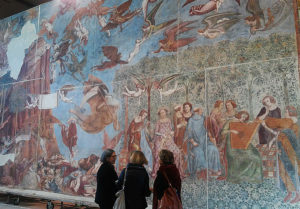 The marvelous frescoes depicting scenes of Pisan saints and from Dante’s Divine Comedy. Throughout the centuries, these frescoes have faced damage from an accidental bombing and humid atmospheric conditions. During WWII, the Campo Santo caught fire from shrapnel of an Allied bomb raid, destroying the roof. A complete modern restoration undertaking was initiated by the Opera della Primaziale in the late 1990s and has an estimated price tag of 7 million euros. Of the nearly two thousand square feet of paintings, Buffalmacco’s the Triumph of Death will be the last to return to the venue and complete the project on June 17, 2018. 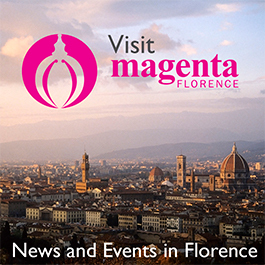 To read more in Italian and watch a video, visit Florence’s La Repubblica new site. Conservation work had initially begun after the war. A team headed by Leonetto Tintori carefully detached the frescoes from the walls. Once the frescoes had been removed, the preliminary under-drawings, called “sinopie” were discovered underneath the frescoes. The under-drawings were also detached from the walls, restored, and are now displayed in the Museum of the Sinopie on the opposite side of Cathedral Square. The restored frescoes were eventually returned to the Cemetery, but over the years atmospheric conditions caused alterations in the calcium casein glue used to reattach the paintings to their new supports; the frescoes gradually became covered with a white haze of soluble salts and mold. The supports were also made of material containing asbestos, which raised safety concerns. Further restoration was needed to address these new problems. The latest phase of conservation, carried out by the Opera Primaziale, the body in charge of the Cathedral complex, is under the technical direction of Chief Restorers Carlo Giantomassi and Gianluigi Colalucci, supervised by Prof. Antonio Paolucci. An innovative system of cleaning, using casein-eating bacteria, has resolved the problem caused by the glue and the old “eternit” supports have been replaced with panels made of the inert laminate aerolam. Engineers Roberto Innocenti and Giuseppe Bentivoglio from the National Research Center and the Opera Primaziale have developed a unique method to address the potentially damaging surface condensation. Thermal mats woven of carbon fiber and polyester fabric are placed on the back of the fresco supports and can be heated to 2/3 degrees above the dew point to prevent condensation from forming. The surface temperature of the paintings and relative humidity are monitored by sensors activated every 10 minutes and in critical conditions will automatically activate the heating of the panels. To make this project even more unique and complete, scientists will use a heating system to prevent damage from condensation in the future.